Pathetic Runner Books, T-Shirts, Hats, Running Gear and Cancer Fundraising. Pathetic Runner - The Story! The Pathetic Runner is the brainchild of author and marathoner, David Johndrow. His signature humor is appealing to the recreational runner who finds themselves feeling pathetic around the more elite runners. His story starts with congestive heart failure and obesity in 2011. 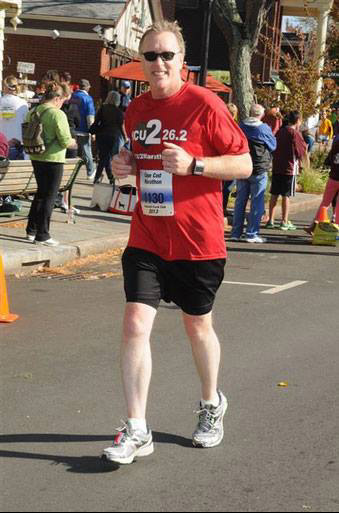 Johndrow seems to find the lighter side of being an overweight, unmotivated and pathetic runner. David has collected lots of information about the sport over the past five years. He has competed in about 80 races, winning not one.Despite that, you'll find some inspiration no matter what level you are. To quote David, "We each have our own journey; therefore, everything I say isn't going to work for you - mostly because you won't heed the advice no matter how sound it may be. My hope is to provide you with enough propaganda to stay injury free, enjoy running for as long as you are alive, and hopefully, improve your speed and performance." Join him in his journey, and express yourself with Pathetic Runner gear including hats, shirts, magnets and shoe charms.